An enduring audience favourite Mahler’s Symphony No. 5 continues to maintain a firm hold on the concert repertoire with an abundance of choice in the record catalogues. It’s a work that can make a deep emotional impression. I can still recall an Olympian performance of the Symphony No. 5 that I attended in 2011 at Berlin by the Pittsburgh Symphony Orchestra under Manfred Honeck. With the performance being given on actual day of the 10th anniversary of the 9/11 terrorist attack on the Twin Towers of the New York’s World Trade Center the performance had an extra poignancy. The orchestra on this Profil release the Hamburg based NDR Sinfonieorchester was established after the war in 1945 under the name of the Symphony Orchestra of Radio Hamburg. Berlin born Hans Schmidt-Isserstedt was the founding conductor and its concerts were played at the Hamburg Musikhalle renamed the Laeiszhalle. The orchestra’s present name the NDR Sinfonieorchester Hamburg (North German Radio Symphony Orchestra Hamburg) was chosen in 1956 following the splitting of the Nordwestdeutscher Rundfunk (Northwest German Broadcasting) into two regions the NDR and WDR. Principal conductors of the Hamburg orchestra have included Herbert Blomstedt, Christoph Eschenbach, John Eliot Gardiner, Christoph von Dohnányi and Klaus Tennstedt the conductor here. 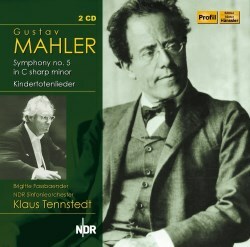 Klaus Tennstedt responds to the multifarious moods of Mahler’s Symphony No. 5 with passionately commitment and enthralling drama. From the first note to the last there's a judicious balance struck between stunningly expressive playing and care for the overall structure. In the opening of the Trauermarsch (Funeral March) the intensity of nightmarish expression and the sheer weight of sound send a shiver down the spine. Overall Tennstedt takes the movement slower than I was expecting. Immediately I noticed the excellent condition of the brass with the strings also radiating a glorious bloom. Such a magnificent creation; in the uplifting second movement who could fail to be impressed by playing that swells gloriously into determined climaxes. The overtly pictorial Scherzo feels like open-air music, a refreshing stride through verdant Alpine vistas with Tennstedt's penetrating clarity communicating the stunning sights and sounds along the route. One could almost be reading intimate pages from Mahler’s holiday diary. Especially striking is the wonderful horn playing and the distinctive rich and firm tone of the cellos. In this movement Tennstedt directs a climax that was shattering in terms of exhilaration, volume and force, almost pinning me back into my seat. Mahler’s declaration of his deep love for wife Alma, the justly famous Adagietto, feels so intense and emotionally persuasive it could break the stoniest of hearts. Imbued with a captivating sense of optimism and vigour the Rondo-Finale just trips along buoyantly, generating great excitement. In the rumbustious final pages the reserves of sheer energy that Tennstedt demands from his responsive Hamburg players is produced in spades. This is a highly engaging live 1980 Laeiszhalle recording from Tennstedt. It can confidently rub shoulders with many of the acclaimed accounts. Nevertheless, I will continue to reach for my treasured live 1981 Herkulessaal, Munich recording from Rafael Kubelik and the Symphonieorchester des Bayerischen Rundfunks on Audite. Mahler composed his orchestral song cycle Kindertotenlieder (Songs for dead children) in 1901/04 to texts by Friedrich Rückert. Following the deaths of two of his children, Rückert wrote over four hundred poems collectively titled Kindertotenlieder. Alma Mahler strongly expressed her discomfort with the subject matter as if composing Kindertotenlieder would somehow tempt fate. Subsequently Mahler and Alma became haunted by the death of their own child Maria in 1907. Given the sombre nature of the inspiration it is not surprising that an achingly poignant mood cloaks these songs. At times I can hear shades of the exotic sound-world that Mahler established a few years later in Das Lied von der Erde. In this live 1980 Kieler Schloss recording of the Kindertotenlieder cycle the sadness and sense of total despair produced by Brigitte Fassbaender’s implacably expressive vocal is almost too sad to bear. It is striking how she is able to deepen and darken her tone to great effect. Overall this is a fine performance without quite matching the intensity of her own compelling 1988/89 Jesus Christus Kirche, Berlin account with the Deutsches Symphonie-Orchester Berlin under Riccardo Chailly on EMI. Another classic account of Kindertotenlieder that stands out from the crowd is the remarkable 1967/69 Abbey Road, London recording from Janet Baker with the Hallé Orchestra under John Barbirolli on EMI. Recorded live in 1980 these two engaging performances are welcome additions to the Mahler catalogue. The sound quality of these made-for-radio broadcast recordings is excellent with satisfying clarity and balance. Regrettably the Rückert Kindertotenlieder texts and English translations are omitted.